Sometimes the support guy becomes the lead guy. This was the case tonight with Florida senior forward Erik Murphy, who was supposed to help carry the load for senior guard Kenny Boynton, who will likely become the Gators' all-time leading scorer by season's end. But against nationally-ranked Wisconsin, Murphy was the star in a sublime performance of a lifetime: 24 points on 10-for-10 from the field, a couple of threes, and 8 rebounds to boot. It was a dazzling array of layups and jumpers, offensive put-backs and sweet half-hooks. Erik Murphy? Where have we heard that name before? "E" aka Eric Murphy was the guy behind the guy on HBO's Entourage. But he became the star of the show - well maybe not within the show where much of the show's ongoing theme was E breaking from Vinnie's shadow, but Kevin Connolly's name was first in the opening credits. 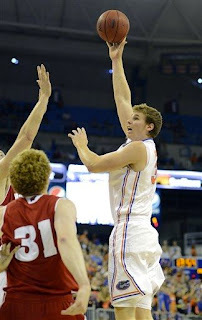 Florida's Murphy has now established himself as at least Boynton's co-star, and maybe a breakout lead on a Top 10 team. He should be getting the star treatment soon enough.